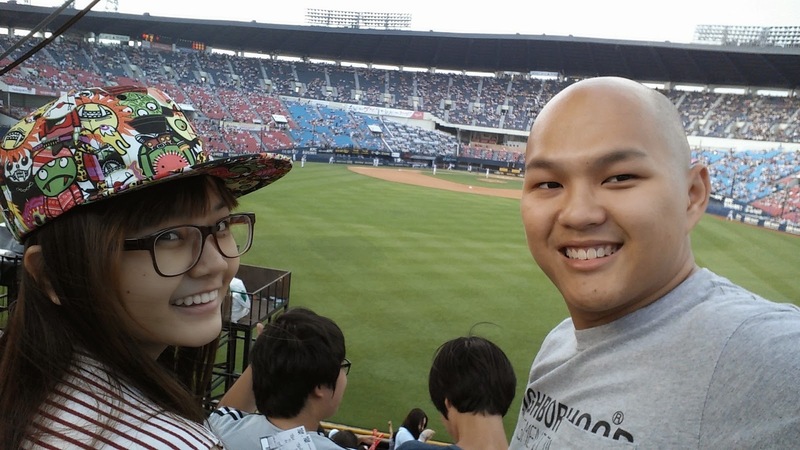 One of the things every tourist should do when they come to Seoul, Korea is to watch a baseball game. 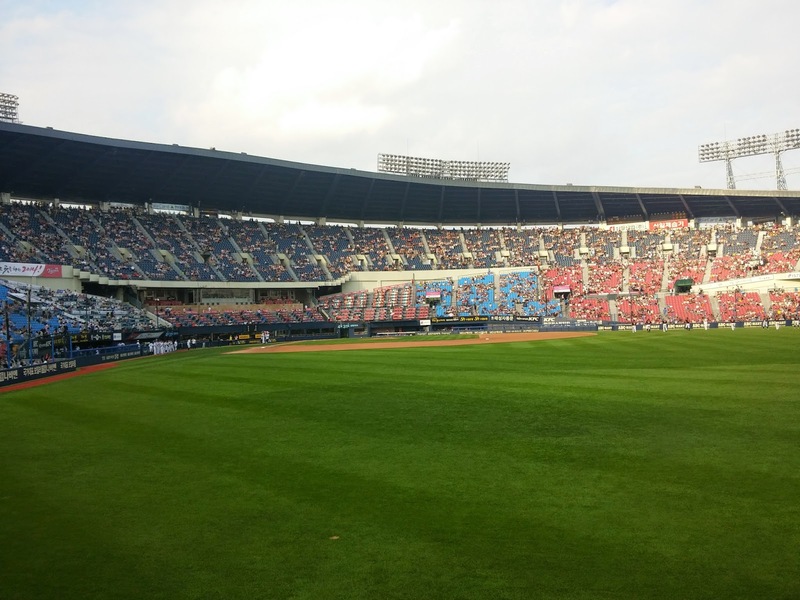 Baseball in Korea, is a very famous sport, as much as you might think soccer is. From the time that they can start running, many boys are into baseball and train as a co-curricular activity in their schools. 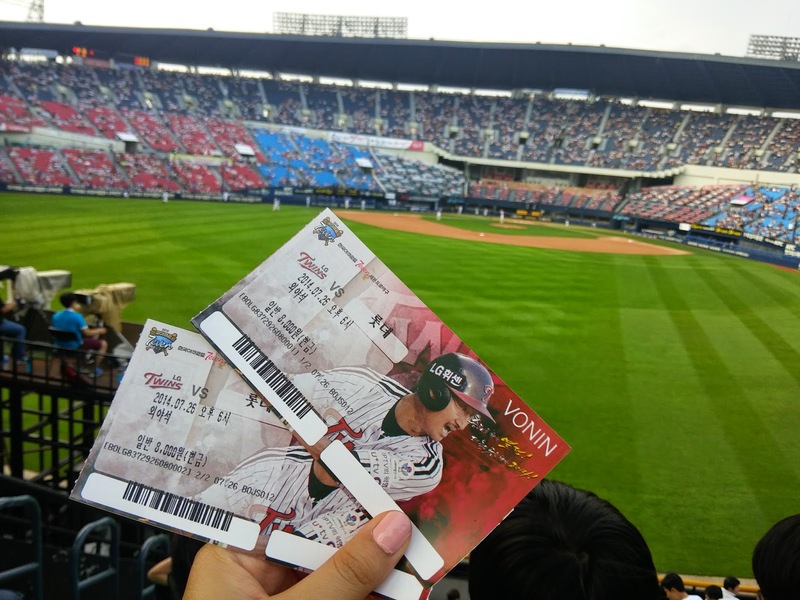 For starters, if you're planning to watch a baseball game in Korea, and have no idea how to go about booking tickets or getting seats, here's a guide on how you can do it. The two teams that are based in Seoul are the Doosan Bears and the LG Twins, so you'll have to look out for their games that are held in Jamsil or else it'll be in another city. And if you're going to be in another city, you can check out the games held there too. Next, you'll need to match the date of the game you want to watch, to the dates that you'll be here in Korea. I'm not much of a baseball fan, so I don't really know what games are more famous because of rivalry/skill/heat etc. But I guess as long as you're going to watch, you'll get the feeling already. Most of the time, if the game is held on a weekend, you can expect at least 80% of the seats to be filled because for some families, it's a weekend family activity to go together to baseball games. Another thing, is remember to buy the HOME side of tickets or else you'll be sitting at the away side alone cheering for another team. Ultimately, I could only buy the outfield tickets (green section) even the ones in the yellow section were sold out. There are two sides to the story, if you're in a less popular game, you can get seats where the supporters are, but there'll be less atmosphere. However, if you're at a more popular game, you'll have to sit outfield, but you get to hear endless cheering, and the atmosphere is really amazing. Okay so, take the train on the circle line (Green) to Sports Complex Station. 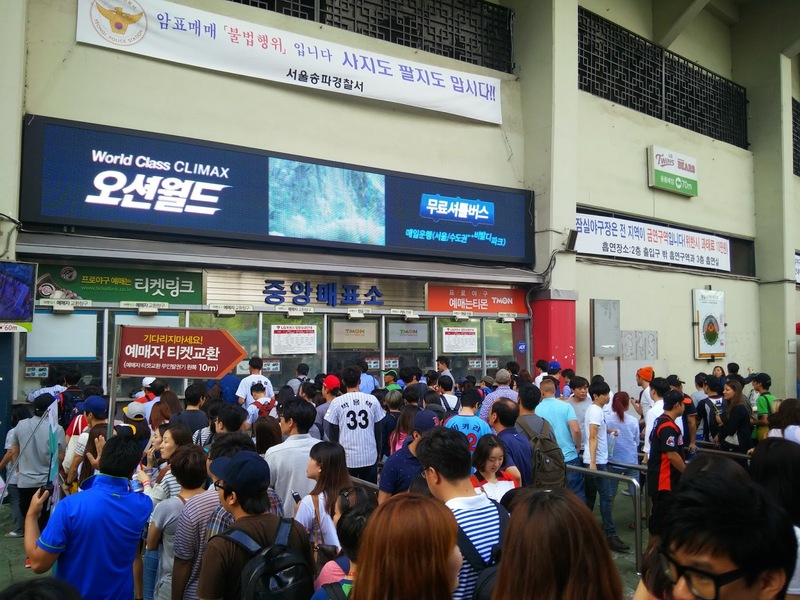 (Yes, even though it's Jamsil, you need to go to Sports Complex Station) and get out at Exit 6. Trust me, if it's a baseball game day, just by getting out at exit 6, you'll hear a lot of noise, from the commentator and audience alike. The tickets cost around 8,000W per person and if you get those seats in the red zone it will cost more, maybe 10,000W or 12,000W. So it depends on your budget and whether you want to sit really close or not. To me, it doesn't really matter because I don't know any of their names, neither was I interested in any of them, but more of the sport itself. Therefore, sitting in the outfield, gave me a clearer view of the entire game, and since I didn't understand the rules and such, my girlfriend was able to explain to me the rules, where they're supposed to run, and basically the entire set up of the game, including the functions of each position. The bad thing about sitting in outfield, is that you don't have a seat number to yourself, and it is free seating so make sure you get in early to get a nice seat. This is one thing I regretted not doing, buying food to bring in to eat.. Believe me, you might think you'll not get hungry, but you WILL. 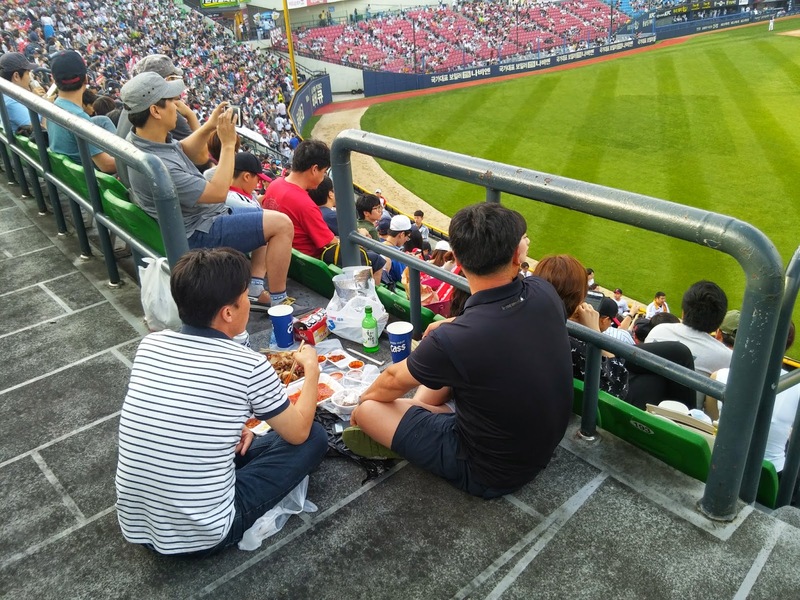 Koreans have a habit of ordering food, having them delivered to the stadium, where they pick it up and bring it into the stadium to eat. 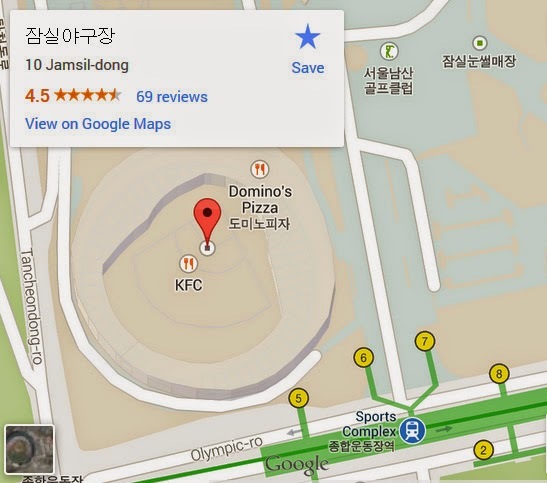 Apart from that, there're people who buy food from the nearby fast food joints located right outside the stadium itself. Because of all these people, the entire stadium, people next to you, below you, and above you, all have food reeking from them and you will probably end up salivating like we did. The food being sold at the stadium is ridiculously overpriced, almost 2x the price of buying it elsewhere, so I really recommend buying food that you can keep for awhile, or if you're a resident in Korea with a phone number, ordering food to have it delivered to the stadium. I realized that Koreans like to sit at the back (on the floors, not on the chairs) with mats laid out, together with chicken and alcohol so that they can eat and make a lot of noise while the game is going on. The atmosphere inside the stadium was tremendous. When we stepped in, the supporters on each sides were already cheering away, singing certain cheers and songs that sounded quite familiar, but in a different language. You can see that they were all well prepared, sporting their teams' jerseys and with colored hats. The outfield seats, on the other hand, had different mixes of people. Even though I was there in the summer, it was really cold in the night because of the wind, so try not to sit too high up, or else bring a windbreaker. Not to mention, if you sit closer to the field, the outfielders who practice sometimes toss the ball into the crowd, so you may get the chance to catch one, if you're lucky! It was really fun watching the game, but even more because of the supporters who never relented their cheerings. Not only is it an exciting game, it was waaaay longer than a movie, lasting from 6pm to 10pm. 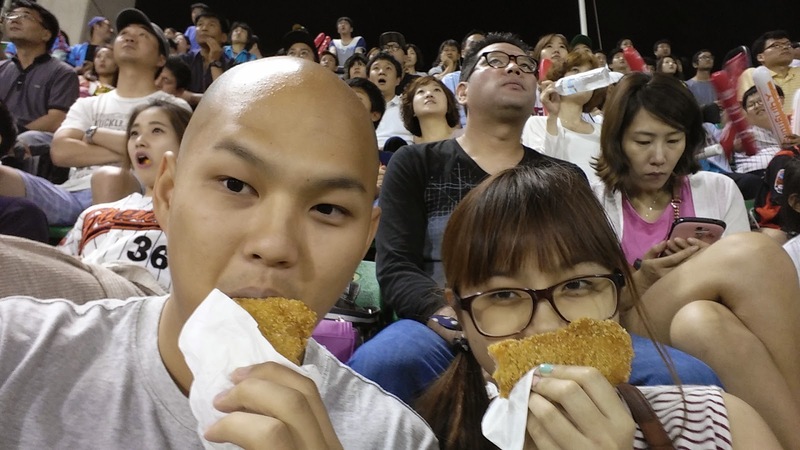 In the end, we gave in to the smell and I went to buy some chicken from KFC and we had a nice feast while watching the game.